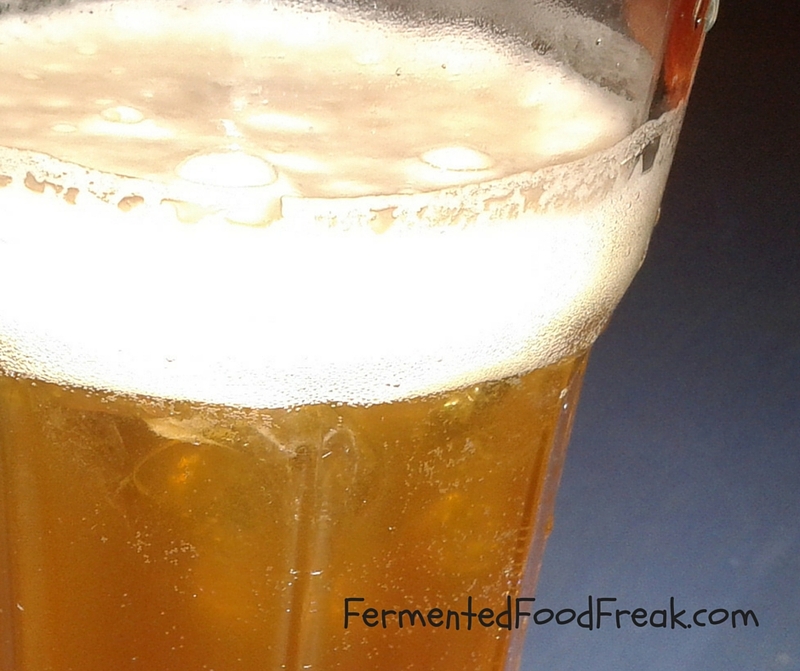 Almost a year ago, I wrote the post about how to brew kombucha. I was at the beginning of my Kombucha adventure then and have brewed more than a hundred bottles since. So, let me share some advanced tips with you. I still use more or less the same technique I described in the original post and it works well for me. It doesn’t mean, I wouldn’t love to have a proper continuous brewing system, but space is a bit restricted in our apartment at the moment. The beauty of a continuous brewing system is that you always use Kombucha from the bottom and pour fresh tea on the top. And this is the proper way of brewing because there is a lot of yeast at the bottom as opposed to the top were lacto-bacteria tend to be. Using the Kombucha from the top of the brew as a starter guarantees the proper composition of the microorganisms as yeast populates faster. However, if you notice that your Kombucha is very flat, even after days of the secondary carbonation, it means that you don’t have enough yeast in your brew. In this case, keep using the bottom part as a starter until you get a nicely bubbled drink. Second important tip: don’t keep Kombucha too long in the fridge. A very wise friend of mine told me some time ago that the low temperature promotes the growth of acetic-acid-bacteria but suppresses the growth of lacto-bacteria and yeast. And this is so true! Kombucha kept in the fridge for days is flat and sour. Thirdly, white sugar works best for brewing Kombucha. I have tried all possible kinds of sugar and must say that nothing beats the ugly, cheap, scary, poisonous white stuff. It doesn’t apply to water kefir, though; it prefers light brown demerara. Also, the best Kombucha is made of regular black tea. However, I would be delighted to know other people’s experiences. I read all the time about fancy kinds of Kombucha, so there must be something in it. I have tried to mix my tea bags as recommended with fruit teas, but it wasn’t very tasty. I haven’t tried herbs, though. That will be my brewing challenge for this year, I think. But I keep brewing green tea Kombucha separately and swap Scoby from time to time, i.e. I use green tea Scoby to brew black tea Kombucha and vice versa. It seems to do good for the Scoby’s condition. That’s all that comes to my mind for the moment. If you enjoyed and live close to Dublin, check my real life events. Also, you are very welcome to read my post with general information about Kombucha and the one about controversies around it. You are very advanced now! You are very welcome! I hope it works for you; it does for me. Thank you for your nice comment! Great information here. I am currently on my 4th brew and have noticed inconsistencies in my carbonation levels. After reading your article, I now believe that this is due to the differences in yeast levels in the bottom of the fermentation jar to the top of the fermentation jar. I have a question: Before you bottle for the second fermentation, do you stir the kombucha to ensure that each bottle pour has equal amounts of yeast? It seems that this would make each bottle consistently carbonated after the second fermentation. thank you for the comment and congratulations on your blog! After removing a scoby and before bottling, I pour a bit of kombucha from the top of the jar as I need it as a starter for a new brew. And then, yes, I definitely stir the rest. As you said, it’s important to make sure all the bottles will get equal amounts of yeast. However, it also depends on the quality of bottles. I noticed that one of my bottles constantly gives me totally flat kombucha, so apparently the neck is a bit wider, so a cap is not tight. Also, if you put a piece of fruit into a bottle it improves carbonation dramatically. For me, peach and/or strawberries work best. Good luck and keep brewing! Previous Previous post: What Is the Gut Flora?